Magnets should be handled with care and treated with respect. Keep individual magnets well separated from each other and do not place magnets near steel tools, benches or other ferrous objects. There are various ways in which magnets and magnetic equipment can be a dangerous hazard. Larger Magnets: Larger magnets must be handled with extreme care to avoid physical injuries such as pinching, cutting and crushing of fingers, hands or other limbs. In particular, do not underestimate the strength of Rare Earth (Neodymium) magnets. Small Magnets: Small magnets are a swallowing hazard for children. If more than one magnet is swallowed or inhaled they can become stuck together within the digestive system and cause serious illness or even death. Seek medical attention immediately if this is suspected as surgery may be required. For this reason Children’s Toys Containing Magnets must be labelled with the recommended Australian Government warnings. We do not manufacture or sell Magnetic Toys. Strong Attraction: Do not use steel tools or other magnetic objects near magnets as they will be attracted to the magnet and could cause damage or injury. Eye Protection: Wear eye protection when handling strong magnets. The hard and brittle nature of some magnets mean small pieces can chip off if they snap together. Pacemakers and Ferromagnetic Implants: People with these devices should not approach large magnets and they should keep small magnets away from their device. They should consult their device manufacturer for specific warnings. 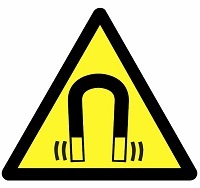 Magnetic Separation Equipment: The warnings above also relate to many pieces of our Magnetic Equipment. Particular care must be taken during the installation of equipment and also during regular cleaning and maintenance. Workplace procedures should be in place to avoid injuries during normal operations.